Like it or loathe it, ‘Sgt. Pepper’s Lonely Hearts Club Band’ was an important album. It embraced the infantile Psychedelic Rock scene, ushered in the Summer Of Love and pushed the boundaries of studio recording practices and techniques. The idea for Sgt. Pepper came from the band’s growing contempt towards touring. They were the world’s most successful Rock group and travelled the entire world, playing to constant sold-out crowds. Tired and worn-out, they decided they would record an album that they hoped, in effect, tour for them. Hence the fictious name of Sgt. 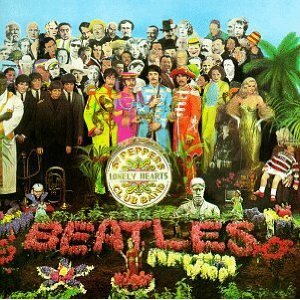 Pepper’s Lonely Hearts Club Band – an alias they could hide behind and experiment under. During the six months of recording, the Beatles made use of numerous known recording techniques such as echo, reverberation and reverse tape looping. They also employed many modular effects, which included; bouncing down (mixing multiple four track recordings into one), the use of wah-wah pedals and a fuzz box, running their voices and instruments through a special loudspeaker (for distortion), and varispeeding (combining various tracks on a multi-track tape with different speeds). But the Beatles not only made the album sound good, they made it look good too. The front cover featured the band (in disguise) standing among more than 70 cardboard cut-outs of famous people, ranging from Sigmund Freud to Marilyn Monroe. They also, for the first time in Britain, printed all of the songs’ lyrics on the back cover. The result was nearly universal popular and critical acclaim, when the album hit the shelves on June 1, 1967. The record went to Number 1 in countries all over the world and spent almost 200 weeks in both the UK and US Album Charts. Since then, it has appeared near the top in almost every single popularity poll and ‘Greatest Album Of All Time’ list that has ever been published. Sadly, it was the last time the Beatles shared a common, collective sense of purpose on a recording. Afterwards they began to pursue different agendas and, although ‘The Beatles’ and ‘Abbey Road’ were still ahead of them, the band never functioned as well together in the studio as they did during the first half of 1967.